There were presents to wrap, suitcases to pack, cards to address, a sleeping baby, and a tired and somewhat-cranky husband looking at me quizzically. Yet, there I sat–frosting, assembling, decorating. The cookie Christmas tree project had become much more work than I had initially anticipated. 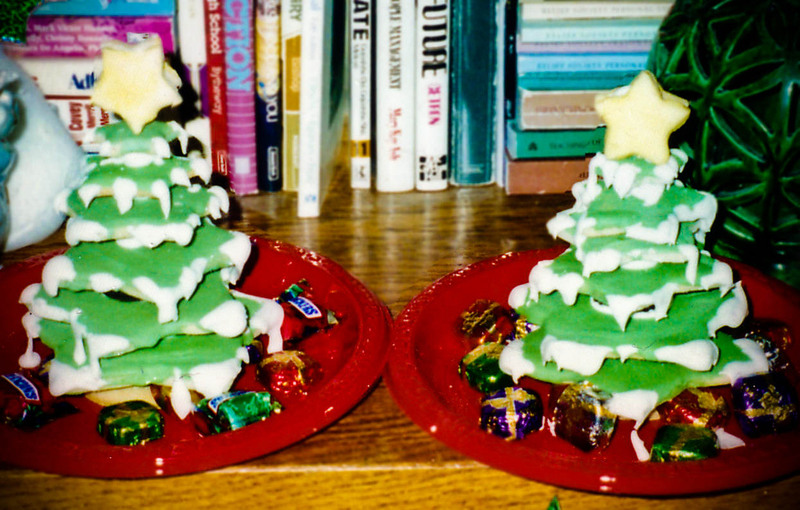 It took so many star-shaped cookies put together to form a tree, instead of a squatty bush. On top of that, many cookies were breaking as we tried to assemble them on their bamboo skewers. Barry, (who I’ll often refer to as BSB–Boy Scout Barry), had already pulled out his power tools and drilled small holes in each cookie, in an attempt to prevent further cookie breakage. Making one tree would have been an ambitious undertaking, but I had decided to make enough trees to give to all of our neighbors and friends as their Christmas gifts, before leaving town to celebrate the holidays with our parents. Did I want to give up? Yes. Did I cry? Probably. But I couldn’t stop. I had come too far. I certainly didn’t have a plan B in mind, and my vision of these perfect cookie Christmas trees, complete with Dove presents underneath, was too great to abandon, merely because of some technical setbacks. I don’t think he (BSB) shared my vision. “Let’s go to bed!” he said. “I can’t!” I replied. He began to express his frustration at my choosing such a complicated project to begin with. Most of our neighbors wouldn’t remember to give us gifts. Why would it matter if we gave them these? He had many compelling and logical arguments. At some point I stopped him and told him that he could go to bed. This was “my insanity,” and I would see it through to the finish. He couldn’t help but laugh through his fatigue and whole-heartedly agree that it was insanity and it was mine! I started this blog to share my crazy ideas with those of you who may or may not be a little crazy, too. I am fueled by creativity and am constantly planning a party, redecorating a room, or prepping some sort of project in my mind. Finding the time and energy to fulfill all of my visions is a bit of a different story as the mother of five young children. And as a stay-at-home mom with limited financial resources, I use lots of creativity trying to find inexpensive or free ways to make things special. I am working on finding less-complicated ways to do the things I get excited about (no more cookie Christmas trees! )–but for some reason, thing often seem much more simple in my mind than when I am bringing them to fruition. Still, my children have come to love my insanity! They remember every birthday party they have ever had and can’t let a holiday pass by with out some sort of creativity being infused. This blog may not show the aspects of my personality beyond that of being a wife, mother, and blogger, so I will reveal a glimpse of them here: I am a former secondary school teacher and a current music/voice teacher. I have been–at various times in my life–a model, actress, and singer (music still being one of my greatest passions), and floral designer. I love to travel (although I am afraid to fly), and have visited several countries on 4 continents (still need to hit Africa, Australia, and Antarctica). I speak Spanish, a bit of Portuguese, and even less French. And sometime before “mommy brain” took over, I considered myself to be somewhat of a scholar. Education is very important to me, and I love continuing to learn about all kinds of things. I still have big dreams about what I’m going to be when I grow up! Wondering where to get started? How about checking out the top posts from the last 7 years of blogging!